Ahead of Microsoft's big press event in New York City today, Twitter user WalkingCat has leaked some images of what appears to be the tech giant's answer to all the popular, low-cost Google Chromebooks now flooding the market. Simply dubbed 'Surface Laptop' in the Twitter post, the unit is said to pack a 13.5-inch PixelSense display with a 'flocked Alcantara' material – that’s the same microfiber fabric found on some Surface keyboard covers – surrounding its keyboard and trackpad. It will also reportedly run a new lightweight version of Windows called Windows 10 S (personally, we'd have gone with Windows Badmin10). If the leaked information proves to be legit, it's possible that Windows 10 S is the official name for Microsoft's rumored Windows 10 Cloud OS that we've been hearing about lately, which seems to be designed to compete with Google's Chrome OS. The series of tweets also state that the Surface Laptop will be available in Platinum (pictured below), Burgundy, Cobalt Blue and Graphite Gold. You can find more images of the laptop in each color and at different angles (including a handy 360-degree view) on WalkingCat's Twitter account. 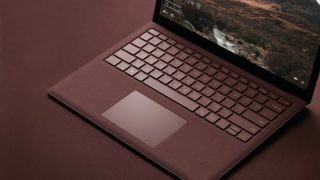 Stay tuned, as we expect to have more solid information on the Surface Laptop following Microsoft's event in NYC today.